Construction waste includes sediment, waste concrete, masonry and other scrap waste. In recent years, with the acceleration of industrialization and urbanization process, highway, railway, house, construction, irrigation, road, bridge and other buildings also develop rapidly, and the consequent construction waste is also increasing. The vast majority of construction waste without any treatment, causing serious environmental pollution. In this situation and demand, construction waste crushing equipment - mobile crushing plant came into being. 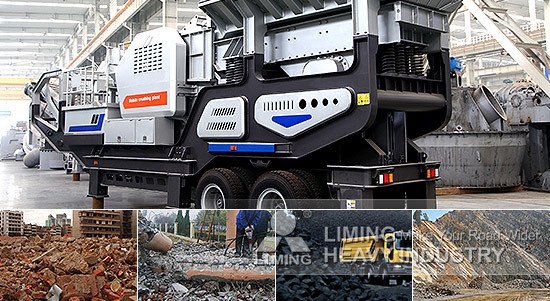 Liming Heavy Industry based on thirty years experience in the research and production, introduced foreign advanced technology and successful experience, devoted to developing the mobile crushing plant. Currently, mobile crushing plant has been used in the construction waste Processing. The construction waste after crushing and screening can be re-used as concrete aggregate, It achieved the recycling of resources.